Did you ever in your wildest dreams think the day would have come when the Seventh-day Adventist Church would be “celebrating” the pope’s arrival on its doorsteps in Washington DC, to address the joint houses of the US congress, and the world, in his bid for a one-world church with a one world Sabbath day—Sunday? Well, that day has actually arrived, and rather than singing the familiar theme of the Third Angel: “If any man worship the beast and his image… The same shall drink of the wine of the wrath of God,” (Rev. 14: 9, 10), our denomination’s front-line leaders are hosting a “musical” in honor of the pope’s arrival! Don’t let the front of “ten commandments” theme of the musical fool you, that’s all it is, a ploy of the enemy to make you believe they are celebrating in earnest the sanctity of Ten Commandments, when it truth and in fact it is the celebration of papal resurgence in the Christian world that is being celebrated. There are a few things you need to also know about this coming September and early October—the “seventh month” of the Biblical year. Ever since 1844 Adventists have thrown away the prophetic almanac, and have stopped observing the passage of time since the memorable date of October 22, 1844, and so have every year celebrated the church’s anniversary on that date as the Day of Atonement (DOA). Because they did not keep pace with the light, Adventist theologians are not aware that the DOA is not a fixed date as with December 25th, but a fixed event based on the seventh lunar cycle of the Creators’ calendar. Not knowing this fact they have traditionally commemorated the Church’s historic roots on the Sabbath closest to October 22nd of each year (at least those Adventists who still believe in the relevance of the 2,300 days of Daniel 8: 14 as taught by our pioneers). Why is this important in light of the pope’s arrival and pubic address to the nation, you may ask? Read on. On the evening of September 24th, after the pope’s ecumenical address, the earth will have welcomed the solemn Day of Atonement, while that night the sky will be silhouetted with a total lunar eclipse, called a “blood moon.” On Sunday September 27th, the Pope will conclude his epic journey to the US and Cuba with the theme of “the World Meeting of Families.” That evening will be the opening night for the biblical Feast of Tabernacles. Coincidence? No indeed! It is the out working of his satanic majesty in the advancement of his career on earth in the titanic struggle called the Great Controversy. So on October 3rd, the 6th day of the eight-day festival known as Tabernacles, instead of celebrating the holy feast, the Adventists will be chanting cadenced messages to the “beast,” in complete jubilation at the “well-loved” pope’s message of unity and ecumenical convergence. Truly did our Savior counsel, “Take heed therefore that the light which is in thee be not darkness,” and “If therefore the light that is in thee be darkness, how great is that darkness!” Luke 11: 35, Matt. 6: 23. Just a bit of background on the National Cathedral. This is not a Protestant shrine, but a national symbol of the Roman Catholic Church, under the auspices of the English (Anglicized) Roman Catholic Church. So in celebration of the “well-loved pope Francis” the Adventists will be serenading in the national symbol of his dragon-appointed plenipotentiary ecclesiastical authority. 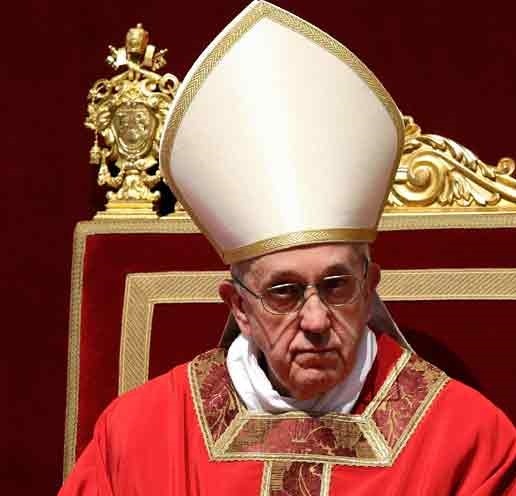 Take a look at the pope’s “mitre” (crown or hat), then look at the arched entrance and windows to the National Cathedral, and determine if there are any similarities. 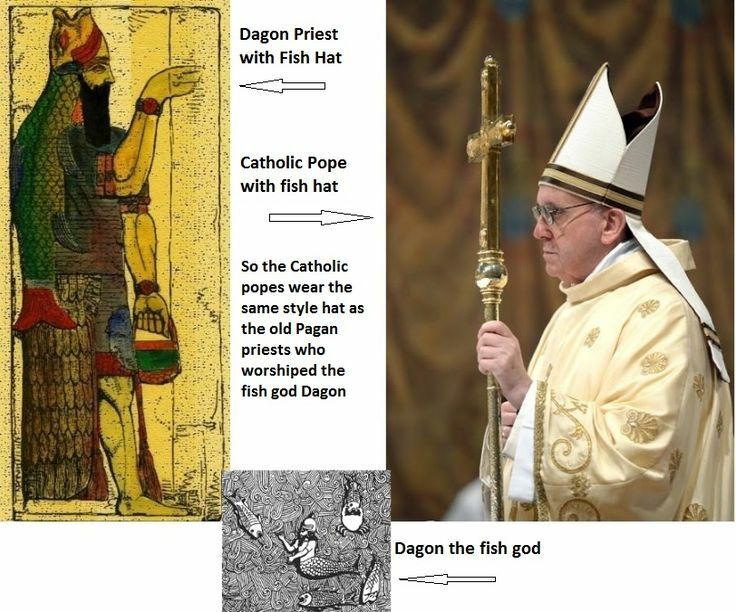 Then also, look over at Dagon’s hat, and see if there are any similarities. From my vantage point, I see a resurrection of the ancient Babylonian religion. How about you? What do you see? Tell us in your comments. Most SDA’s are content with believing that the Sunday Law will be the only decisive issue in these last days, but they are wrong! While there will be conflicts with a national Sunday Law, that will only be the capstone in a series of compromises which have been made, and so Adventists will not hesitate in making the final step, because they have already compromised in so many other places before. Be reminded of this fact, that the 144,000 who declare the Loud Cry of the Third Angel’s message, have this insignia as their badge of honor, “The Commandments of YHWH and The faith of Y’shuah (Jesus),” (Rev. 14: 12), and not “the Sabbath commandment alone and the faith of Y’shuah”. So the final issues will surround “the commandments” of God, and not just the Sabbath question. For instance, homosexuality is as much a part of the mark of separation from holiness, as is Sunday sacredness in the last days. This goes to show that these closing issues are bigger than just lisping the Sabbath. Think of the many Jews who keep the Sabbath, yet promote homosexuality! To break one of the precepts of the Torah is to break all, and keeping one at the expense of others, is both folly and madness. “These things ought we to have done,” says the Saviour, but not to leave the others undone. Time: 5:30 pm EST; Date Every Sabbath (Saturday).